Today was a memorable day for me. We had Jerry Levin, the former CEO of Time Warner, come and speak to the TechStars teams in New York today. Now let’s just gloss over the fact that having him take time to come talk to a bunch of us goofy entrepreneurs is pretty cool on its own, what really left an impression on me was the fact that he spoke to us candidly. My honest impression was that he sat up there as a broken man trying to help a younger generation. Wait, what? He sat in front of us, the former CEO of the largest media company in the world, the product of endless hours dedicated to his craft, a lifetime of 4 hour sleep nights and missed birthdays to become the man he was, and he told all of us he took the wrong path. Dead wrong. He did it wrong and we should think about what we’re doing with our lives before its too late. At least that’s how it came across to me. The sentiment was that he led a life of absolute devotion to his career for almost 40 years, never sleeping a full night, and feeling like because he did that it made him a stronger businessman. He told us of how his son had died, and his takeaway at the time was that nothing worse than that could ever happen to him, because it was a tough thing to deal with, and therefore he was an even stronger businessman now. His marriage and his kids never saw him, but because he wasn’t tied down by “family” commitments, he felt that made him a stronger businessman. The “I haven’t taken a vacation in 20 years, let alone a sick day” approach to 40 years of his life had left him now full of remorse. So he sat in front of all of us, as a courtesy to our young futures, and looked back on the end of his career analyzed his legacy, and the conclusion he dre for us today was that he had made all the wrong choices. It was tough for me to sit and listen to this because admittedly, I do not have the greatest balance in my life. I am guilty of taking pride in keeping ridiculous work hours, of working more than anyone else and sleeping less, of keeping myself mobile with very few roots, and if I were to look back on my legacy, I wonder if I’d say that I had done it wrong. Had I missed the things that really mattered? He made the comment “If you ever make people feel like they’re in second place, like the only thing that matters is what I’m doing, you are doing it wrong” ugh, I think we’re all guilty of this. The old ‘give the illusion that what I’m doing is the most important so you’ll think I’m cool” bit, yeah, so that gets old. But he talked about how that had hurt his marriage and his relationship with his kids, and it wasn’t until he was at the end of his life looking back that he even realized he was doing it. He said that when he was climbing the ranks, he would meet people and immediately begin to assess if they had some value to Time Warner, if they did, he’d humor them and continue the conversation, if they didn’t he was immediately disinterested and would find a way out of the conversation ASAP. That’s another one of the things he would have changed. Pay attention to people, quit asking them what they do and instead find out if they’re happy, if they’re good, who they are, etc. The sentiment being that it’s people that matter and don’t forget that. He talked about addictions, and how an addiction is anything that gives us a high. He pointed it directly at us when he asked why we are entrepreneurs? Are we in it seeking the high? Are we addicted to the startup life? If we had a successful company could we handle just taking the paycheck and being happy or do we chase the high? Are we addicted? And any addiction is unhealthy, so find a way to moderate your intake, you will sustain yourself longer and have a life you are genuinely happy with, and won’t look back on yourself at the end of your career with regret. Addicted to success, addicted to power, to work hours, to your office, to working more than everyone else, addicted to raises, whatever it may be … addiction is more than just drugs. Take a serious look at yourself and make sure you’re working towards balance and not putting it off while you chase your fix. This was one that stung a bit because I’ve often described what I do as “I help people start companies, either for investors or for friends, I help start them” and people will respond with something like “oh, doesn’t that get old?” then I puff out my chest a bit and beam as I say “no no, that’s the part I love, the long hours, the working like crazy, the confusion, the excitement, the rush of starting the company, that’s what I love” Those conversations came to my mind continually while he talked about addiction and I had some tough questions to answer for myself here. I guess, for me, this was so notable because it is just very rare to see someone who is successful in life, in the sense that he made a lot of money, had power like few ever will, and seemed to have everything that every kid right out of college dreams of, but to have him look back at all of his success and wish he’d spent more time at home and ‘accomplished’ less, I have to say I was a bit taken aback. I mean, I know how the story goes, how you never get to the end of your life and wish you’d spent more time at work, but in the middle of it, the application is difficult to see as a 20 something entrepreneur. So I guess it meant a bit more for me, to have Jerry Levin say after everything he’d done, experienced, earned and learned, well he’d give it all for more time with the family, better health, and more friends. On behalf of myself, techstars, and any entrepreneur or business driven mind who reads this, thanks Jerry, I hear you loud and clear. When I get an email into my inbox, it remains unread until I’m ready to take action on it. Once I’ve read it, I take action and then forget it. If I am unable, for whatever reason, to take the appropriate action on the email, I mark it as unread until I can. Thus when I look at the inbox, the unread messages are tasks, things I need to accomplish. Despite what you may think, this actually puts my mind at ease doing it this way. When I email you, I am giving you the responsibility of the next step in that conversation. I don’t have to think about it until you’ve taken that step and given it back to me. Burning through almost 600 emails daily, it’s the only way to stay sane. So now my gmail is a masterpiece of multiple inboxes and “is:unread in:inbox” type search queries that keep all my to-do’s in focus. So ever since I was a kid I’ve worked out of one email address. I have dozens of email addys, but they all forward to my one main address. This address is where the ends of the law are answered. It is the alpha and omega of my communication. But wearing many hats with multiple projects, companies, endeavors, ideas, relationships, support, growth, research, etc all being conducted at once, my inbox zero vision has not been seen for years. Literally I’ve been fighting to get things down to 200 or on a great weekend, 100 unreads. I simply couldn’t get to everything before everything was replied to and came back. I think I’ve spent at least 8 hours a day in email for over 2 years, and I still couldn’t get ahead, and with such confusion in the inbox, I was missing things. Things that needed attention were getting put off for months without my realizing it. I was losing the battle. So I finally figured it out. Kill the funnel. This may seem obvious, but it has saved my flailing sanity. I finally removed the forwards from my multiple email accounts. My multiple work projects each go to their respective email accounts, my personal to my personal account. Etc. I don’t see them all in my one big well. Seems a bit counterintuitive at first eh’, but it’s not, I promise. What happens is I get going early in the morning with my personal email. I am able to respond or take action on the things that deal with my personal life. 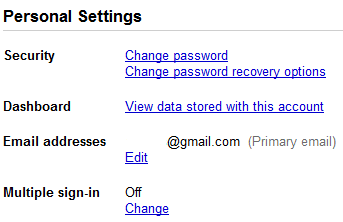 I quickly get back to inbox zero (or as close as I’ll come to it) and then I leave this running and use google’s multiple account sign (just enable in your google ‘acounts’ section – see figure 1) on feature to sign into my first work email and enter work mode. I have about a hundred emails in here waiting for me by morning, but once I hit stride with my responses, I am able to burn through these quickly, and leave labels on emails that are awaiting response from someone else. As soon as I’ve read or labeled everything, I call that inbox zero. I move on to the next one and repeat, until everything is knocked out by 11am. I go through this same exercise 2-3 times a day, but after the morning push, the rest are easy. The key here is I still have my one or two unread messages and a few tagged for followup, but the few in each inbox is manageable and doesn’t overwhelm, whereas in one inbox it would quickly seem insurmountable and I would become discouraged in the quest for zero. I’m not exaggerating when I say this move alone has shortened my time spent in my email by almost a third. I get on top of my entire day quicker and am losing fewer conversations. The moral here, good people, is separate your personal inbox from your work/project inboxes, the quality of life improves. I promise.